Carve Me A Bear Chainsaw Carvings provides unique custom chainsaw carvings for many folks throughout the Las Vegas, Nevada Valley. 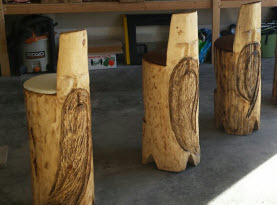 These specialized carvings are great gifts for birthdays, anniversaries, weddings, house warming, Christmas, or simply to say “ I Love You”! 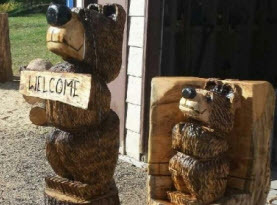 No matter the why, these unique carvings are handcrafted by Clark the Carver that has been passionately carvings figures with his trusty chainsaws. Winning the hearts of many consumers, awards, and accolades, a work of his fine art makes a perfect addition to any home or business. Among the many sculptures Carve Me A Bear Chainsaw Carving creates include Bears, Birds, Bunnies, Chickens, Cowboys, Coyote, Dogs, Eagles, Garden Wizards, Horses, Indians, Lions, Mascots, Moose, Mountain Men, Owls, Pigs, Raccoons, Squirrels, Tiki’s or Totem poles, Wolves, Custom Furniture such as benches and tables, Custom order Signs, Mantels, Flower Pots and Memorial Planters and so much more! Carve Me A Bear Chainsaw Carvings carves your favorite mascot. Mascots are utilized to represent a group with a common identity; for example a school, military unit, social organization, professional sports team, and so on. These mascots typically are objects, animals, or people that are often representatives or spokesperson for the consumer products as well as fictional mascots for merchandising, advertising, and marketing gimmicks. Additionally, mascots are predominantly used in the sporting industry; which is not always the same as the team’s nickname however often interchangeable. In an effort to deliver entertainment and excitement for the spectators using animals as a form of an animal was originally the first thought of sporting organizations; though mascots were originally fictional icons or people in the specific suits. When the animals become a useful prop at sporting events, the idea was to intimidate rival teams, which would bring a different feel to the game. Eventually evolving into the modern two dimensional predatory animal mascots along with the new era changed and time marched on, as they were once two dimensional fantasy characters and it is because of the invention of the Muppets in the 1960s that prompted such a change. The Muppets allowed the spectators to have visual enjoyment and the opportunity to interact physically as the different development from traditional mascots occurred. Because marketers realized the great potential in the three dimensional mascots from the Muppet perspective mascots being a necessity amongst the sporting industry as well as other organizations encouraged other companies to start creating their own mascot. With the many different mascots affiliated with college as well as professional sporting teams, many people find a mascot that is partial to them. Whether it belongs to a school they went to or their favorite team among other reasons, having a replication of their favorite mascot is an impressive and unique gift to add to their collection. No matter who your favorite mascot is, Clark the Carver of Carve Me A Bear! 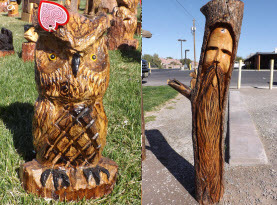 Chainsaw Carvings has the talents to create your custom made mascot for you or someone close to you. These little works of art make perfect gifts, especially during your favorite sporting season. 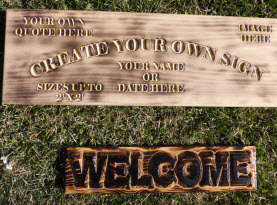 Contact us to order your custom chainsaw carving tody.